Arsenal couldn’t have asked for a better game to ease back into Premier League action. 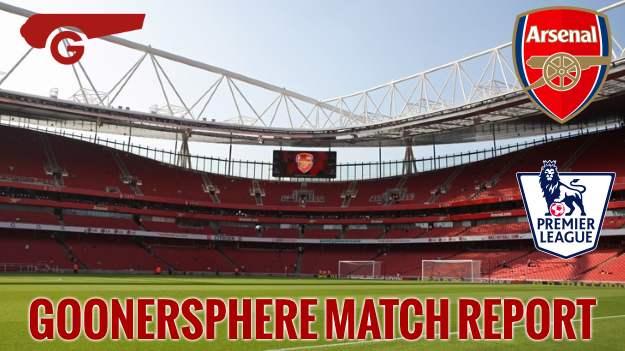 With the memory of our quarter final defeat to the same opposition still fresh in the memory, you might have expected a much sterner test for an Arsenal side clinging to the coattails of the title race. However, this game was anything but a challenge as we dismissed Watford with ease and checked one of the eight cup finals off the list. It took just four minutes for us to seize control of the game, through a combination of an established star and a potential star in the making. Alex Iwobi got a goal on his first Premier League start and this time provided the assist, clipping a really good ball to Alexis at the back post. The Chilean left Nathan Ake chasing his own tail and powered a header at goal. Gomes saved the initial effort, but Alexis was first to the rebound and squeezed it into the net. From that moment on, the game turned into a bit of a training exercise for us. Watford had none of the intensity and fight they showed in knocking us out of the cup, as they allowed us time and space to pass and move the ball. We took a while to grab the second goal, but it was worth the wait. Coquelin initiated the move with a well paced ball in between the full back and centre back, finding Alexis who’d left Ake for dead again. With a chance to shoot, Alexis was surprisingly generous, this time choosing to return the favour and lay the ball on a plate for Iwobi. The youngster still had some work to do, but finished the move emphatically to cap a brilliant first half for him. If Watford had designs on a second half comeback then their hopes were quickly crushed in slightly cruel fashion. More good work down the right forced Nyom into a poor headed clearance and Bellerin’s first time shot took a wicked deflection over the keeper and in. Unlucky for Watford, but thoroughly deserved for Bellerin who had an absolutely brilliant game. After Bellerin’s goal the second half was just a stroll. Arsenal pressed a bit and probed for more goals, but with no real urgency and no real need for there to be. A lot around me wanted us to go hell for leather and try to run up a huge score, but really there was no point. It was much better to conserve our energy and keep everyone healthy for the next game at West Ham. Even so, Iwobi hit the bar and right at the end Joel Campbell set up Walcott to tap in a fourth. All Arsenal can focus on now is trying to win every game in front of them. One game at a time, we might pull our way back into the fight. It’s unlikely, but we have to try and we also want to try and catch Tottenham, as missing out on St Totteringham’s day would be an added kick in the teeth to a painful season. I don’t believe Leicester will mess it up from here, they have too much of a lead and they are too consistent, but if they do, we have to be right behind and ready to pounce. On to West Ham we go. Özil - 7/10 - Fluent and tidy, just needs to get those final few assists for the record! Iwobi - 9/10 - Superb, two goals and an assist in two starts, keep it up Alex!